Today’s leaders are asking big questions. How can I increase employee engagement? How can I help my team increase their leadership capability? How can we achieve more of the goals we set? If these questions resonate, you are in the right place. SupportingLines offers a simple, yet powerful framework to improve performance and increase engagement. Join us in our mission to inspire leaders, help teams perform and engage millions of people in their work. According to Gallup, 85% of the world’s working population is disengaged in their work. That is a startling statistic. Given how many people are disengaged, no wonder we have so many challenges in our society. So what can we do about it? The only solution to this global, societal problem is a radical change in the way we lead. We will engage more people if we give them opportunities to grow, collaborate and achieve meaningful goals. Workplaces will transform if leaders support their teams and teams support each other. Our coaching clients find the SupportingLines framework gives them the confidence to take on the courageous work required for profound leadership development. In a recent goal-setting session, one senior executive even said that the process of SupportingLines goal-setting was “actually fun”. Take the next step in your leadership journey by learning how to see supporting lines, not reporting lines. The world needs strong leaders, now more than ever. Harness your leadership potential with SupportingLines so that you can better engage your team while achieving more goals. Many people think organizations and institutions are responsible for low engagement, but organizations have not lost their way – leaders have. Great leaders support their people, and great teams support each other. Sounds simple right? Well, with our framework, it actually is. We see these formal commitments to support each other as ‘supporting lines’ – if these commitments are honoured, the results are amazing. This is not corporate cheerleading. The results speak for themselves. We worked with a team that struggled to deliver results on time and on budget for customers, which created significant tension and millions of dollars in budget overruns as teams scrambled to deliver. By ensuring that key supporting lines between teams were visible, understood and agreed upon, the team achieved deliveries over 90% on time and on budget. As a result, team engagement and customer satisfaction also increased significantly. 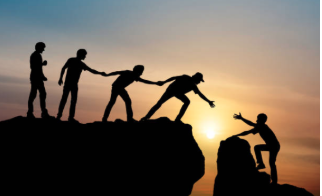 We have seen many real examples of how the simple act of supporting one another can improve the way we do business and enhance the way we experience life. All the tools are in front of you. Let’s do the work.